The Department of Electrical and Computer Engineering announced its award recipients for 2016-2017 at the Annual ECE Graduate Student Banquet held on September 25. 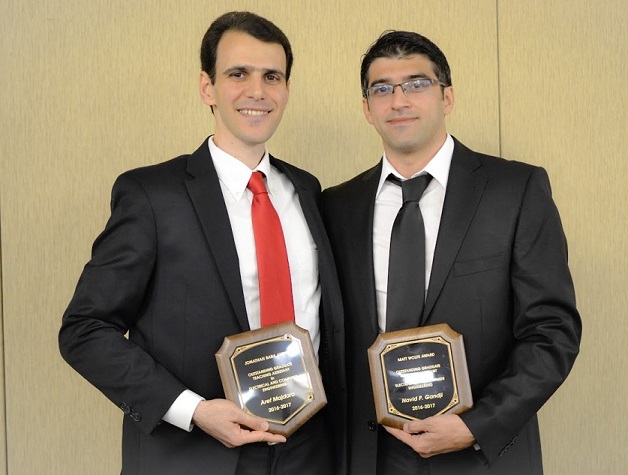 Aref Majdara received the Jonathan Bara Award for Outstanding Graduate Teaching Assistant and Navid Gandji received the Matt Wolfe Award for Outstanding Graduate Research Assistant. Dr. Glen Archer, ECE associate chair and TA supervisor said in his nomination “Aref is one of those rare students who seems to excel at everything you ask him to do. He has worked as a TA for several years in a variety of different courses and received praise from the students in every case.” Archer stated that Aref’s performance in the Circuits lab “revealed a quiet patience that motivates students to perform at their best” and in the more difficult to staff labs such as Microcontroller, Embedded System Engineering, and Signal Processing, “Aref accepted these challenges in the same way he faces everything, with purposeful resolve and a relentless pursuit of excellence”. Mr. Majdara’s PhD advisor is Prof. Saeid Nooshabadi. Dr. Elena Semouchkina, ECE associate professor and PhD advisor stated in her nomination for outstanding GRA, “Navid Gandji’s research features two important aspects: (1) novelty at the frontiers of engineering physics and (2) addressing vital societal needs. Navid’s work is in a very competitive field of artificial materials, including photonic crystals and metamaterials, which were named by the American Physical Society as one of the top three physics discoveries of the first decade of the new century. His work comprises theoretical studies, full-wave electromagnetic simulations, and experiments on a unique automatic microwave field mapping fixture, which he helped to develop and advance.” Overall, during his PhD studies, Navid has authored and co-authored 4 journal papers, 4 more papers are in preparation. He has also authored and co-authored 5 published refereed conference proceedings and made two presentations at the IEEE International Symposium on Antennas and Propagation, the major forum in the field. The ECE Department congratulates Aref and Navid and appreciates their many contributions to the department, university, and their field.